In terms of nostalgia-baiting, key chain toy animals that depend on their owners for sustenance, Japan's Tamagotchi's are a bonafide classic -- if not the less garish version of your old Furby. So everyone elated by the news of Tamagotchi's return in Japan this year should be pleasantly surprised to learn that the toys are finally making their way to the United States next month. Yes, the '90s bare repeating once more. If living like a prepubescent version of yourself sounds interesting, Tamagotchis will be available in six different colors, and will retail for $15 when they go on sale November 5. Parent company Bandai is manufacturing the new fleet of egg-shaped devices in the same vein as their original 1997 forebears, albeit at a slightly smaller size. 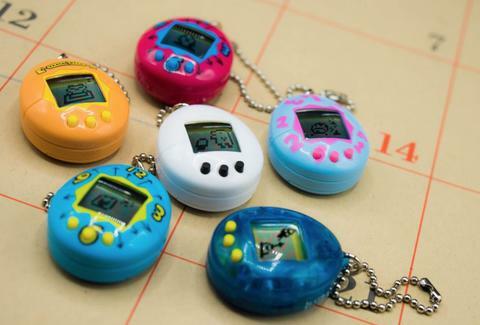 The 20th anniversary edition Tamagotchis will have 16x16 pixel screens and three buttons underneath. Caring for your plastic pet is going to get easier, according to Mashable. While you'll still tend to their every beck, call, and poop, they're prone to chirping less frequently, and only require a minimal amount of attention when they're feeling needy. Whether you'd like to read your Tamagotchi a bed time story or introduce it to the family at Thanksgiving is completely up to you. While it remains to be seen if the toy will be popular with today's meme-savvy teens, the Tamagotchi should still pull at the heartstrings 20-somethings who routinely miss out on buying the hottest Nintendo gadget and don't want to be responsible for feeding anything in real life.